The Waiheke Winegrowers Association (WWA) have introduced an audited certification system which is available only to wines that are fault free and 100% made from grapes grown on Waiheke Island in a vineyard that is Sustainably Certified (Sustainable Winegrowing New Zealand, SWNZ) and produced and bottled in a Sustainably Certified Winery (SWNZ). This is the first regional certification of this type in New Zealand. 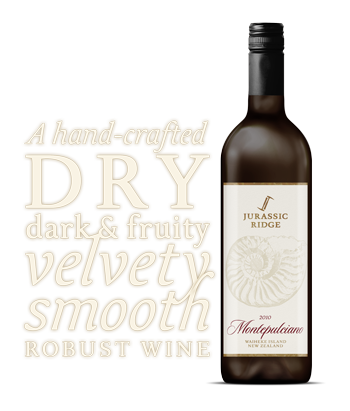 Jurassic Ridge wines are suitable for all wine lovers including vegetarians and vegans as NO animal products such as beef skin or pork gelatine, fish protein, egg white or dairy products (eg milk powder) are used in their production – thus Jurassic Ridge wines could be described as ‘natural’ or ‘authentic wines’ (after James Goode), but certainly wines that are designed to reflect their ‘sense of place’.